For Qur'an hifdh/zh, repetition and continuity are two strategies you must adhere to. There's little point spending only an hour each week in between work and personal affairs with the hopes of rememering sentences, in a language which is most likely not your mother tongue. So, for total memorisation, you have to have the determination to read the Qur'an at least once daily, preferably after each salat and especially after fajr (the morning prayer). 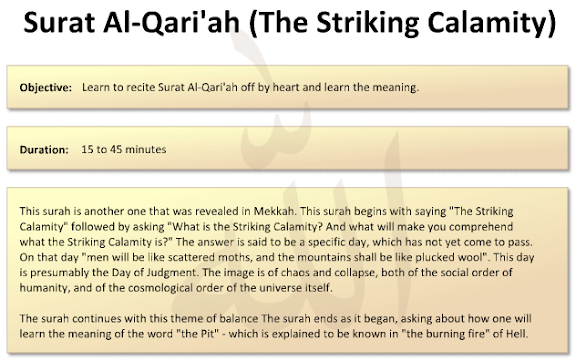 I struggled with Surah al-Qari`ah for a while because I neglected these strategies. While it is a relatively short surah (chapter) comprising of repeated questions and words, some parts would not fit into my already tired head. Therefore I took it upon myself to drop everything else and focus, focus, focus. Now, I've clocked it. Alhamdulillah. By following 5 (Zaufishan-approved) steps, hopefully you can clock it too. Say bismillah! Are you a visual learner? Do you remember everything you hear? Can you instantly follow detailed instructions? If you're a dominant visual learner, stick to your chosen mus-haf (Qur'an script) each and every time. 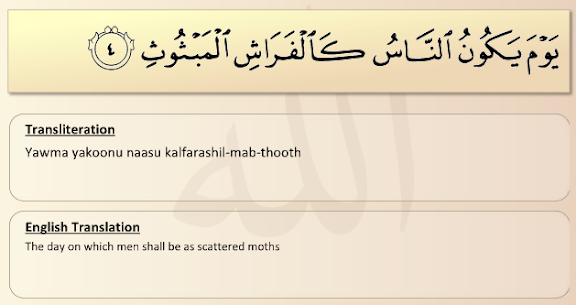 Larger Uthmani text is better with the complete tashkil (punctuation marks), as is used on Quran.com. This is clear, "modern" Arabic with the fathas, dhammas etc, that mark all the vowel sounds and recitation rules. The mus-haf al-huffaaz (known as the memorisers’ codex - i.e. the text of the popular green edition from Madina written by the world famous calligrapher, Ta Ha Uthman) is recommended by Kalamullah, which is divided up structurally, whereby the Qur'an being thirty juz` (parts), every juz` has 20 pages and every page has 25 lines. As it is the most accurate contemporary print you'll do yourself a favour by getting a copy. It's beautiful to look at too. If sound is your skill, either get a tutor to recite to you or download your favourite qari onto your mp3 player/ipod. Use the same teacher or qari for every memorisation lesson and recite clearly after them. Always go back to the Qur'an text to proof-read each ayat (sentence) and double-check your recitation with a qualified teacher who has ijaza' (permission) to teach the Qur'an. Allahumma dhakkirni minhu ma nussietu, wa `alimni minhu ma jahiltu, war zuqni tilaawat'ahu aa-na-allaili wa-aa-na annahaari, waj'alhu li hujjatan. "O Allah! Revive my memory of whatever I was made to forget from the noble Qur’an, grant me understanding of whatever part I know not, enable me to recite it during hours of day and night and make it my main argumentative support (in all matters). Ameen." ii. With this you also need focus. Block an hour before/after fajr every day, and half an hour after each salat. Switch off your phone, internet, ipod, and should you be blessed with a television, sacrifice that too for your Qur'an. Inform everyone around you that this time is only for Qur'an, so you cannot have distractions of schoolwork, errands or social events. iii. While your environment needs be distraction-free, focus also comes from within. Make wudhu properly, slowly, with attention to each movement. Dress properly; sit in an upright, comfortable position, whether on the floor or at a desk - use back support - and be in good light. Daylight is the best source, but at night after 'isha, a bright lamp needs to be your new companion. All of this affects how you learn and your mood so think positive vibes, stay calm and start reading. iv. Finally, repeat, repeat, repeat. Take small portions of Qur'an text, up to 10 verses or less at a time, repeat them for 20-30mins, then take a 5 minute break. In Islamic principle, if you get tired, you need to stop. You are a student and need to be at your most alert. After each break go back to your mus-haf and repeat. 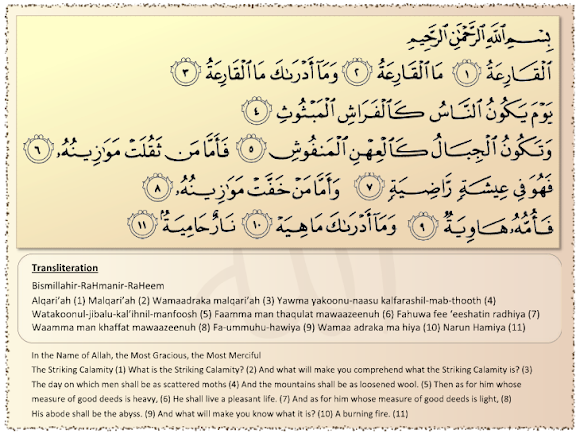 When you're not in "Qur'an mode", say for example you're driving, repeat what you learnt that day, say it aloud. The Prophet ﷺ compared the forgetfulness of memorised Qur'an to water pouring through a sieve, therefore repetition around ambient noise helps to make it more concrete and resilient against memory loss. (C) and basic fasl/wasl - division and joining of sentences. At this point you need to beware of your voice’s beauty from distracting you. Your tone's sweetness encompasses you in the atmosphere of chanting-like-recitation, so you may start thinking that you’re 'like this famous reciter or that famous reciter'. While you should emulate your teachers with deliberation to perfect the letters, slow down if you feel your ego's inflating and step down from that pedestal; keep learning like the student, not the master. Once you've mastered Steps 1-4 with every recitation you'll find that your heart becomes attached to the Qur'an and so missing just one day will give you heartache. After these dynamic foundations are laid your appreciation of meanings, Allah's message and of Islamic history will increase dramatically; these are "ilmy notes" that help you connect to Allah's world, and by extension, connect to Allah. I cannot stress enough how desperately you need the Qur'an actively in your life. Approach it as a sincere friend with thirst for knowledge, don't get too cocky in completion of readings and let Allah's Qur'an slowly reconnect you to nature, people and 'imaan - faith. This is soul-food, man, not a punishment! Sister ji, I think if you browse the mp3 downloads available through some of these Qur'an sites, you'll find what you're looking for. Otherwise get yourself a full Qur'an CD set by the respected Qaris such as al-Ghamdi or Mishary.